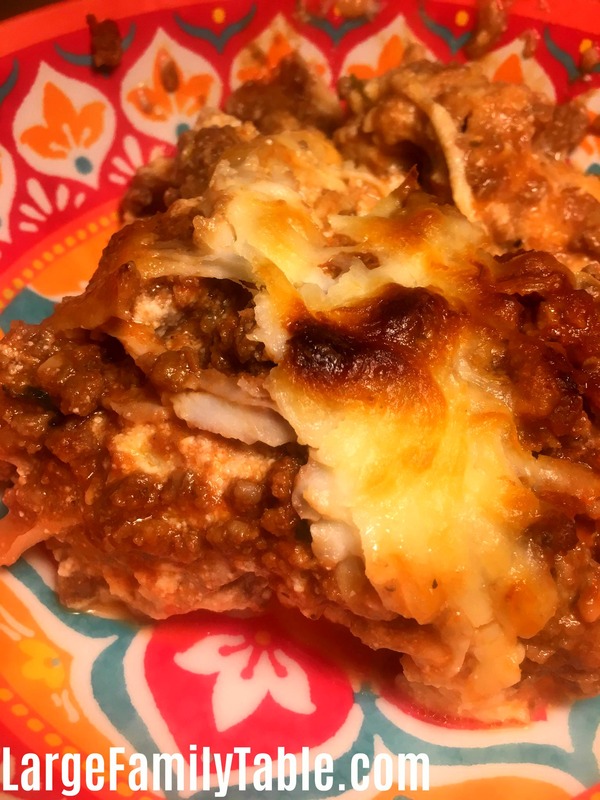 If you’re looking for a wholesome and healthy Large Family Cabbage Lasagna Freezer Meal Recipe then this is the meal for you! This large family recipe makes 4 deep dish pans of Family Cabbage Lasagna. The best part is these hearty pans of cabbage lasagna are so cheesy and awesome that you don’t miss the noodles. Added bonus, this low carb lasagna freezes and reheats beautifully. Serve one on your freezer cooking day and freeze three for later. 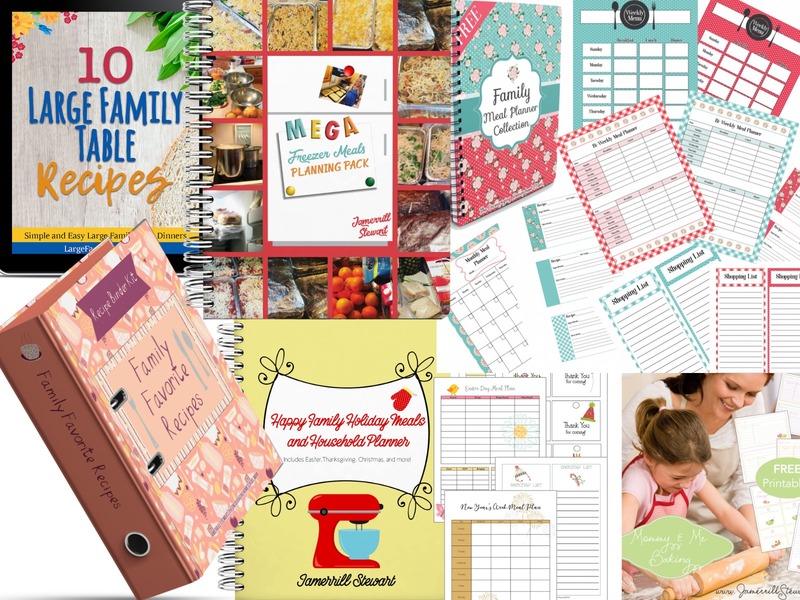 Don’t forget to snag the FREE Large Family Food Collection with meal planners, holiday planners, the recipe binder creation kit, baking printables, and so much more! 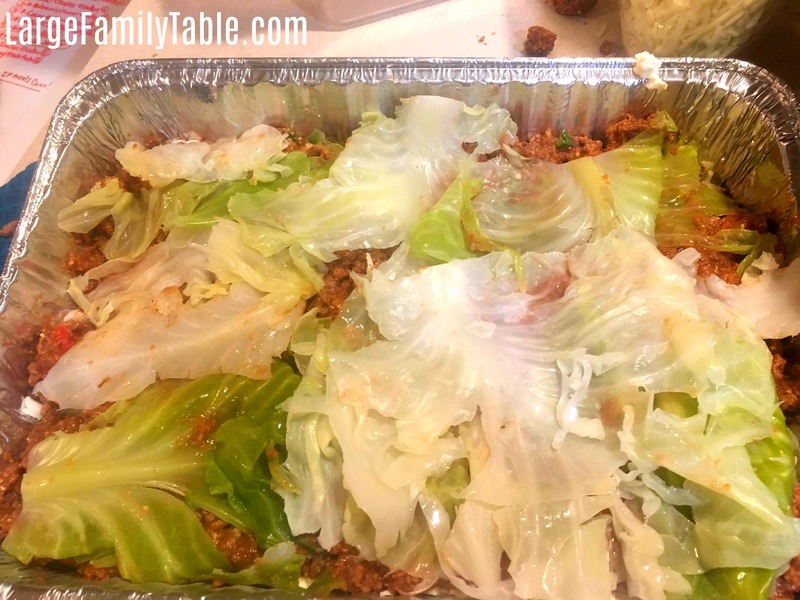 I used foil deep dish pans to make this make-ahead batch of 4 low carb cabbage lasagnas. 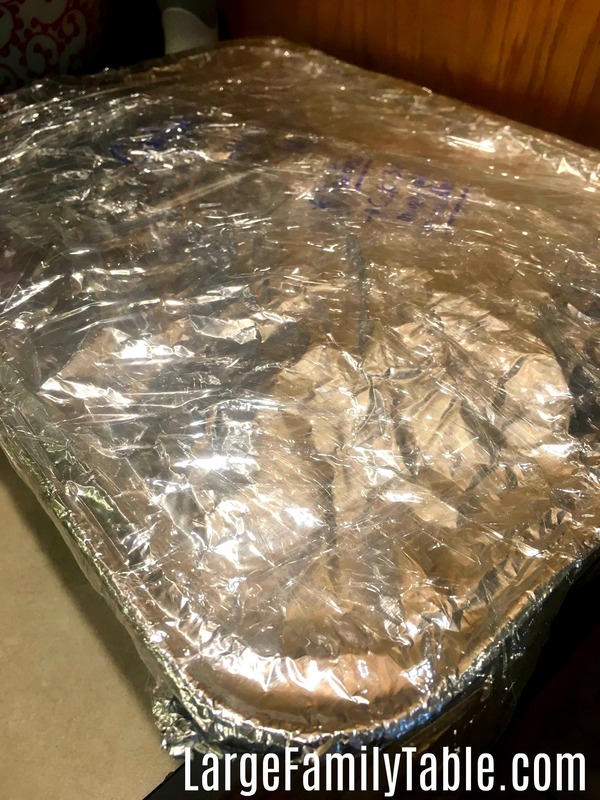 You can also use glass baking dishes and follow manufacturers directions for freezing and reheating. Serve this Cabbage Lasagna with salad! 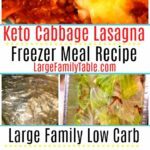 This Large Family Cabbage Lasagna Freezer Meal Recipe is low carb, Keto, and Trim Healthy Mama S-meal friendly! You’ll have 4 deep dish pans of cabbage lasagna in your freezer to make a healthy and hearty meal fast, quick, and in a hurry. Mix four 32.oz containers of ricotta cheese, 10 large eggs, 4 cups of parmesan cheese, 2 Tbs garlic powder, and 2 Tbs onion powder together in a large mixing bowl. I have recipes for big batch spaghetti sauce that can be made in the electric pressure cooker or slow cooker. On this freezer cooking day, I went even simpler as you’ll see in the following directions. Cook, drain, and crumble 10 lbs of ground beef (I used pasture raised ground beef, but you use the best you have available). Combined 10 lbs of precooked ground beef mentioned above and a big 108 oz can of sugar-free spaghetti sauce. From what I’ve seen those big Hunt’s brand cans available at Costco or Walmart appear to be sugar-free. Mix together completely. Gently peel the leaves of two cabbages into a large bowl. Place in a large stockpot and cover with water. Drain cabbage “noodles” and let cool in the colander while you prepare other ingredients. Pour two cups of meat sauce (made above) in the bottom of the pan. Spread out as needed. Spread out a layer of precooked cabbage leaves to cover the sauce. Gently spread out two cups of ricotta cheese on top of cabbage leaves layer. Sprinkle 2 cups of shredded mozzarella cheese. Pour two cups of meat sauce and gently spread out. You should be able to complete the 3rd layer. Top lasagna with shredded cheese. To bake a Large Family Cabbage Lasagna now place in preheated oven at 375 degrees for 30 minutes or until heated through and hot and bubbly. Set the desired pans of Large Family Cabbage Lasagna out in the refrigerator the evening before you’d like to serve to your family. Place in preheated oven for up to 1 hour or until heated through and hot and bubbly. If cooking from completely frozen you’ll need to double the cooking time. 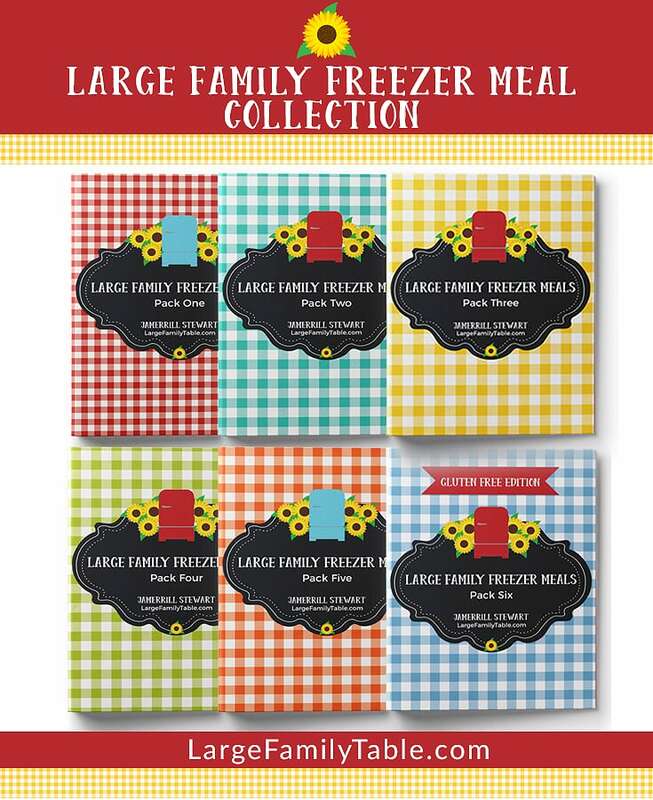 I have found making large family freezer meals a huge lifesaver in my large family life. 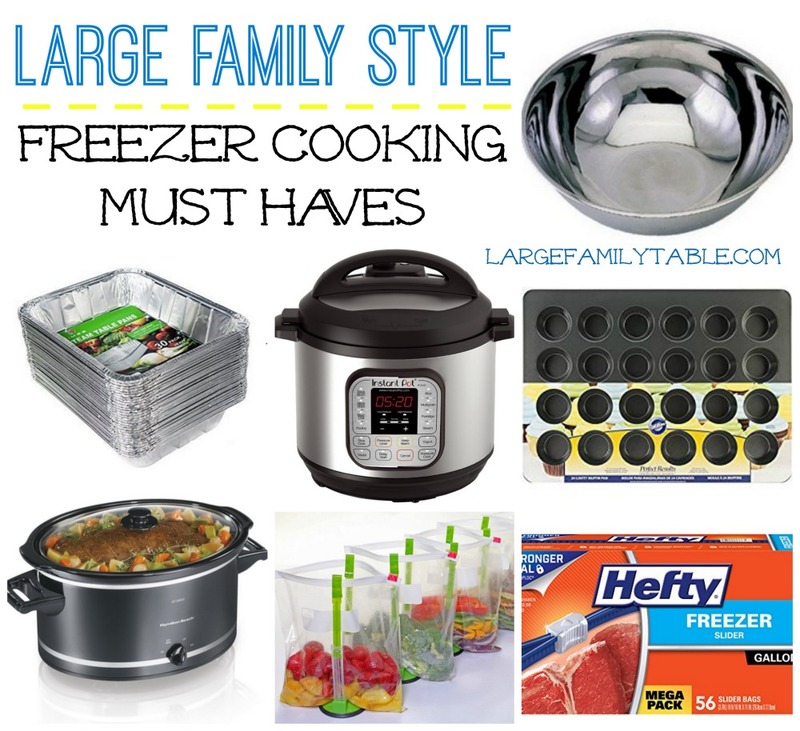 If you’d like to see the tools I use here are my must-have freezer cooking supplies for large family freezer cooking. 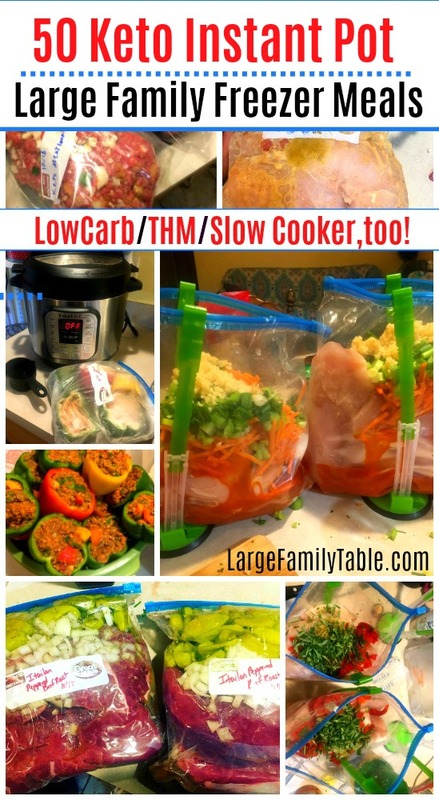 If you love this easy large family freezer meal recipe you are sure to love these 50 Large Family Keto Instant Pot Freezer Meal Recipes here!